The P3119, our latest 4-channel (up to 8-channels) system, permits case depth testing with up to four (or eight) transducers (in parallel) without having to change the transducers or cables. The system features a rugged industrial rack-mount computer (19") with an optional touch screen, allowing easy operation in shop environments. 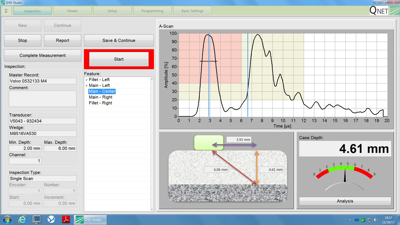 The custom designed SHD (Surface Hardness Depth) software enables the user to perform case depth testing and managing of test data with unparalleled ease. The system offers many time-saving features including toolbar commands, pull-down menus, user-defined colors, multiple displays and context-sensitive Help. A/D conversion of the rectified return signal at 80 MHz, 8 bit. USB 3.0, 1Gbsp Ethernet, etc. Complete reporting and documentation features.